The daily ritual of early morning runs may be par for the marathon training course, but are you mentally fit? People who are not psychologically prepared can find the experience daunting and overwhelming, research shows. Realistic expectations of performance are also key to success. The findings come ahead of Sunday's London marathon when more than 33,000 runners will pound the capital's streets. People who can cope with the stress of "hitting the wall" - the fatigue that sets in during the latter stages of the race - are more likely to enjoy it and persevere, it is suggested. The conclusions were drawn by Andrew Lane, doctor of Sports Psychology at the University of Wolverhampton, after he questioned runners taking part in last year's London Marathon. He quizzed 30 entrants, who ran for the Cardiac Risk in the Young charity, both before and after the race. 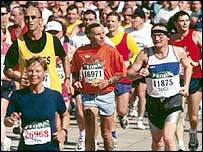 He found that the runners - some of whom were more experienced marathon runners than others - split neatly into two groups. Sixteen of them - of mixed marathon experience - who had a positive attitude before the race, indicated by anxiety coupled with excitement and calmness, were highly motivated during the race. They said that although fatigue set in during the latter stages of the race, it was not unbearable. This contrasts with the other 14, who experienced feelings of "anger" and "depression" during the hardest part of the race, which left them feeling dissatisfied afterwards. All 14 had experienced anxiety combined with negative emotions before the race started, said Dr Lane. Dr Lane said: "We can't say for sure why this happened, but we can speculate that people who coped better were more confident in their ability and able to cope better during the most challenging parts of the race. "Anxiety is motivational when coupled with feelings of excitement and calmness but harmful when coupled with an emotional profile characterised by feeling depressed, tense, tired and confused." Despite negative feelings in some of the runners, none said they would not run again. Dr Lane said being realistic about your performance is also important. He said: "Know about your comfortable running speed and stick to it. "The 16 who were positive about their race had gone at a steady rate. "Those who bombed through at the beginning and didn't drink properly and who drank 'power' drinks when they weren't used to it, had negative responses after the race." Dr Lane, said it is not too late for this year's marathon entrants to improve their mental fitness. He said: "They can imagine how bad it is going to be in the worst parts on the day and look at strategies for dealing with it. "We know music can be functional and some runners may benefit from fixing a song in their head. "Talking to yourself during the race in a positive way is also useful and believing that you can do it." One runner who has taken part in eight London marathons agrees with this. Bill Goadsby of the Daventry Road Runners said: "If you are aware of when you are going to hit the wall, then you can prepare for it." His view is that preparation is everything and with a bit of training, there is a potential marathon runner in everyone.